Fortune's Alex Taylor asks Renault/Nissan CEO Carlos Ghosn about the failed GM alliance, global warming and the state of the auto industry. NEW YORK (Fortune) -- Why are you so insistent about an alliance with a North American producer? We can be in a scheme where Renault and Nissan will stay together for a very long time and we can be in a scheme where in one year down the road, two years or five years down the road, we can have a third partner if it makes sense. It's logical. We know through the analysis that we have done with General Motors that the synergies are significant. We know them. We know where they will be coming from. We think the synergies are big and we think, based on our successful alliance, that if it's managed well and appropriately, this alliance can unlock not only all the synergies that we've seen but probably more. Are you anxious to get a deal done? Frankly, if I had to pick the moment I would not pick the right moment today. There was a very, in my opinion, clear signal from the market. [When the GM proposal was announced] our share went down, Renault's share went down, Nissan's share went down, General Motors' share went down, if you remember, for a few days. I heard a lot of our shareholders worrying that we were getting distracted, we were spreading ourselves too thin.. I think they were right. If we have to pick the time ourselves, if it was our own initiative, it would have never been at the time we have done it. It was not the appropriate moment. But what I'm saying today is now the next time, if it happens, we're going to select the time. We're not going to just, you know, say that sounds nice. We're going to select the time. The time's going to have to be a time when our stakeholders feel comfortable and feel good about an initiative like this or an opportunity like this. I don't want them to be scared that we are spreading ourselves too thin. That's a business opportunity, that's about creation of value, it's nothing else. It's not about the sake of scale or the sake of mimicking any other company or competing against other companies. It's about creating value and working together and contributing more to the development of the automotive market. I think we're going to have to wait until the Nissan growth, which started again a little bit, is really confirmed and significant and unquestionable. If you want to expand the alliance, you have to do it with the full support of all your stakeholders and they should be completely confident that not only it's a good opportunity but you're going to manage it well. Now that you've seen the inside of one Big Three company, do you see the Big Three stabilizing? Or do you see financial distress continuing for the foreseeable future? Frankly, I think the industry as a whole is going through tough times. I don't think it's a factor which is limited to the Big Three. I think all car manufacturers are facing an environment that is very unfavorable. The headwinds are here for everybody and 2006, I would say, has been for the management one of the toughest years we've had. Again, you look at the balance sheet of Nissan and you look at the balance sheet of Renault or you look at the profitability of Nissan and even the profitability of Renault - I mean, you say "Well, there is no problem from outside," which is true. But our expectation was much higher than what we're doing. That's where we say that the year has been tough from both sides. It's not a very favorable market. And it's taking a little bit more time to get the attention around your product. Would you be a buyer for Jaguar, Range Rover or Volvo or all three? No. I think from the Nissan side, the brands that we have, the branding of the company with Infiniti as a brand and Nissan as the main brand I think it's fine and we can compete and we can expand and we can grow with this. I don't think we need other brands. From the Renault side, today the main challenge is not so much adding new brands, it's bringing new products and re-enhancing the Renault brand with these products. Does Toyota just continue to grow and grow and grow? I think in our industry, when you do the right thing you got the right results, you know. The question is, it's not always easy to do the right thing systematically. From time to time when you miss something, you're getting punished for it. If you miss two things, you're getting even more harshly punished. If you miss more than two things, then you start to be in serious trouble. But I don't think there is anything unfair in what's happening. It's hard but at the end of the day, if you keep doing the right things it's unlikely that you're not going to get good results. So we can continue to add market share all over the world? Frankly, I think yes, there is no reason to stop doing things. Every time we have a bump in the company, as long as you sit down and try with your team to analyze why we're having this bump and what are the lessons you're going to get out of this bump and what are you going to do differently in the future, you're on the right track. If you know your problem or if you attribute your problems to something which is beyond your reach, you're in trouble because it's going to keep repeating. Now, if every time you have a problem, you sit down and analyze it and see what I'm able to do in order to avoid repeating this problem, in a certain way you're on the right track for continuous success. Do you expect to see further rationalization of the industry in Europe? It's very difficult to predict, to forecast what's going to happen. But if there is one forecast I can give to you without frankly taking too much risk, it's that I think there will be less actors in this industry five or 10 years down the road. There is no doubt about it. Overall you may have new actors coming. You may have it. But overall when you add all the actors in this industry five or 10 years down the road overall, the number's going to go down. How long before the Chinese start exporting to the West? Oh, not long. Not long. I was sitting down with my team and I say if I was a Chinese company, how I would come the US market, it's very simple. I would come with a very cheap car. I was looking, we were looking at the US market and see that there is practically no car selling at less than $10,000 in the US market. That's it. If all the car manufacturers keep this segment of the market open, well, it's going to appeal to a very low-cost car manufacturer to come and try to propose product there. It's always the fact that we are not really addressing what customers want which is going to create new competition. I don't think in the U.S. market, you're going to have a newcomer unless you are leaving a field that nobody from the existing competing companies want to address. You can't have globalization if you don't accept diversity. If you don't accept the fact that you're going to have more participation from the Chinese in the global economy, more participation from the Indian in the global economy, more participation from the Middle Eastern countries, well, in a certain way you are against globalization because globalization is synonymous with diversity. This global economy is going to have many identities in it and many cultures and many participants and it's a fact of life. I'm always amazed when people say there is this threat coming from China or the threat coming from India. Well, there is no threat. In this case, if you're considering participation of Chinese car manufacturing as a threat, that means that you still do not understand the nature of globalization. The nature of globalization is there should be more Chinese and Indian, et cetera. What's the biggest hurdle for China or India, or Renault, for that matter? Is it quality, is it suppliers, is it a distribution network? For any newcomer? The hardest part is first you need to know why you are coming. What is your added value. Because if you're coming to be a me-too, I think you're going to have a hard time. But if you're coming with some specific target or having identified the need that has not been addressed, it's going to be much easier. So you need to know what's your contribution to the U.S. market. If you have a clear contribution and particularly if you have a contribution that nobody else can emulate, you're in good shape. That's the most important part - what's the mission, what's the contribution. Now when you know that, you're going to have to - the US market is a market that is tough, which means you're going to have to invest for a good period of time and accept not to have a return. So not only do you have to have a clear mission, but you're going to have to come with the kind of long-term vision about your coming to the U.S. These are, I think, the most important hurdles. Have you changed your thinking on alternative-fuel vehicles? Or you'd still rather be a fast follower than a leader in technology? It depends. I am in a certain way trying to position both Renault and Nissan in a situation where we do not impose technology on the market but we try very quickly to address what consumers want. That's our set. So we're not trying to say, well, we think that hybrids are going to be better than diesel or diesel is going to be better than gasoline or gasoline's going to be better than fuel cell or fuel cell is better than an electric car. We don't try to do that. The Japanese can go in one direction, the Europeans can go in another direction, America can go in a third direction. You may have a different concept in China than the one you have in South America. So we want to make sure that we are ready on all these technologies. For example, Nissan is taking the hybrids, Nissan is taking the fuel cell, Renault taking the diesel, Nissan taking the CVTs, Renault taking the robotized transmissions or the bio-ethanol, the flex-fueled engine. Then we are exchanging. So you're never going to hear me talking about what kind of technology we want to impose on the market. Because in a certain way, it's against the customer-oriented approach that we want to have. But we cannot ignore any one of these technologies because we don't know. We just don't know. I mean, the U.S. seems to be going more hybrid. There are more hybrids sold than diesels today in the U.S. market. It looks like it's going a little bit more hybrid. Europe is definitely going diesel. You don't see any hybrid in Europe. It's definitely going more diesel. South America is going bio-ethanol, flex fuel. So you see that as a global car manufacturer, you can't just stick with one thing. It's very dangerous. Oh yeah. I think this is something we need to take very seriously and this is something that we need to address not only today but tomorrow and we need to work very hard on it. I'm not sure we understand all the components of global warming. So everything limiting fuel or increasing fuel efficiency and limiting CO2 emissions is a good thing. So what have you learned from this crazy, schedule you're on? Have you changed your management style? Are you less of a micromanager than you used to be? It's interesting. My management style, obviously it's very particular because I have a job which is very specific, very neat when you are CEO of two companies, one based in Paris, one based in Tokyo. The way you're organizing yourself is obviously, by the force of the conditions, very specific. I'm trying to do what I need to do for each company and contribute to each company in a way where I can empower the people who are working with me that I trust. I mean, I don't think you can do this job if you're not surrounded with people you trust and that you empower. But at the same time, when I tackle an issue, I tackle it fully. I mean, I'm very selective into what are the issues that I'm going to tackle. But what I select, one issue, I usually don't do it at 50 percent or 80 percent, I do it 100 percent. If I take one issue, I'm going to micromanage it, then I'm going to make sure that it's completely sold, every single aspect of it. But because of the nature of my job, I cannot do it for many issues. It's impossible. So you have to empower your team, but at the same time you have to be on the front where it leads you. So yes, from time to time you pick an issue and you help and support your team, solving the issue and you give your opinion very clearly, no vagueness, no confusion, no gray zone. We just put it right and wrong. But you cannot do it for many issues. You have to be very selective, you have to establish your priority and you have to make sure that you're not doing what you like to do but you do what you need to do. These issues are pretty obvious because we will bring them to you on the table. At the end of the day, you can be a good contributor as long as you like what you're doing. If you start to have a hectic schedule and getting into a kind of machine-like problem-solving, you're going to lose the interest in your job. You're going to lose the taste of what you're doing, you're going to lose - at the end, you lose your motivation and then you're ineffective. So I try to be careful not to push it too much. Taking on Renault and then this GM alliance talk has made you a huge celebrity CEO. 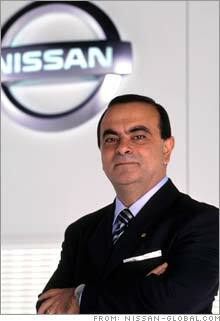 Is it bad for Nissan and Renault to have a CEO with so much visibility and so much power? I don't think it's bad for the companies because when we talked about this alliance with General Motors, I've never seen Renault cited so much in the United States since I started. So in a certain way, it was very good to introduce the familiarity of the company and the familiarity of the brand. Fundamentally it's a good message. What the alliance is carrying is a very good message because first, it's a message of hope. These were two companies, Nissan was in 1999 a company in trouble, Renault was a very small, regional company. But just joining forces and working together, today it's the second-largest market capitalization in the car industry and the second most profitable car conglomerate in the industry. But it was not obvious seven years ago. So it's a message of hope that it doesn't matter where you're starting from if you're willing to ally yourself and accept diversity as strength and work for synergies, you can progress a lot. You can become a strong contributor. It's also a message of hope and a very positive message because in a certain way, you're saying you don't have to merge, you don't have to blur identities in order to be successful. You can stay yourself, you can still have a very clear level of accountability in your own company and still have a different kind of performance by just extending your hand and accepting a partnership with somebody else who has the same purpose, which is a very positive message. The alliance is unique, one even though it's made of very different companies. Renault's a very French company based in Paris and expanding globally and Nissan is a very Japanese company, established in Tokyo and growing globally. These two companies have nothing in common except the common willingness to have some identities work together for the common good.